Name some of the structures of a flower. Make an inference of the function of flower structures. Describe and name some flower structures. 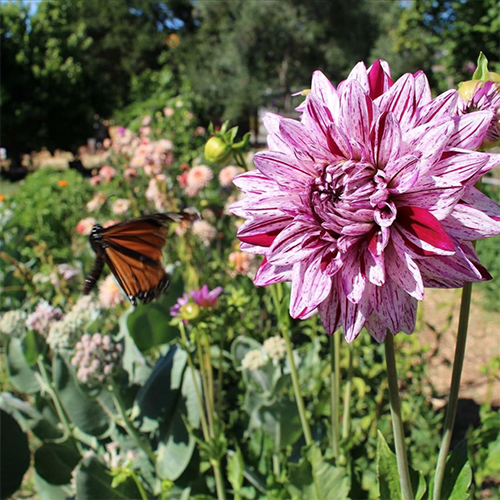 Explore the flowers in the garden during a flower hunt activity, create a scientific drawing, and label the parts of a flower using a key. Welcome students and introduce this Flower Discovery lesson. Explain that this lesson is an opportunity for them to learn how flowering plants reproduce by studying real flowers. "We will be doing a guided exploration of flowers in the garden, primarily looking at their structures and functions. Does anyone know what structure and function mean?" Ask students to share responses and then read out the definition. Divide students into groups for the flower hunt. Get students excited about exploring the garden by telling them there’s cool stuff all around us! Explain that their focus of study will be flowers in the garden. "We’re going to explore and study flowers kind of like scientists do." Ask a student to read the structure and function definition out loud. Practice the definition using a Think-Pair-Share activity. Ask students to come up with an example of a structure and its function with their neighbor (this will be their partner in the activity). Share out. Introduce sketching and recording information as a scientific tool. Explain that looking at structures and how they function is something scientists do. Introduce techniques that are used in scientific illustrations: draw what you see, detail, labeling, questions, multiple angles. It’s not about making a pretty picture. It’s about noticing things accurately and writing them down. Sometimes a drawing will help show what you noticed; sometimes words will communicate it better. Use both in your study. Tell pairs that they are going to go on a flower hunt to explore and find as many types of flowers as they can. Explain boundaries and safety for the flowers. "In pairs, you’ll have five minutes to explore this area and observe as many flowers as you can. We will not be harvesting the flowers, but rather focus on their structures. Your goal during exploration time is to be gentle with these plants and to find as many different kinds as possible, so you can choose a favorite. You can grab a clipboard, pencil, and blank paper either now or in five minutes, after your exploration. You will choose your favorite flower and make a scientific drawing of it, recording as many observations and questions as you can, like a scientist would." Facilitate student exploration; circulate and troubleshoot. After five minutes, inform students it’s time to choose their flowers and begin drawing. Each pair chooses one flower to focus on. Make sure each student has a clipboard, pencil, and blank paper; each student records observations through writing and drawing. Give them about 15 minutes to draw. Assign each student pair to a different group. Circulate to each pair to explain how this “swap” time will work. The “A” students stay with their flower to share findings. “B” students will circulate among the “A” students, like a pollinator. The "B's" are to visit at least two flowers. Let students/scientists know they’ll be discussing their discoveries and questions, not just lecturing each other on what they found. This should be a discussion, not a one-way lecture. Using the sentence prompts “I noticed,” “I wonder,” and “It reminds me of,” "A's" and "B's" will discuss flowers. Begin swap convention with “B” students circulating and instructor participating. After the "B's" have visited two flowers, ask students to circle up for a share out of their discoveries. "What do you notice about the flowers in the garden? What are some plant structures that help them survive here?" Provide students with a targeted exploration time in which they apply the structure and function lens to the garden scape, including the chickens! Ask that they be prepared to share their observations in Closing Circle. Gather students for a closing reflection activity. Share observations from the day.